There is no definitive description of what is or isn’t Social Circus. What’s your definition? Add it in the comments at the bottom of this page! The transformative power of circus connects education, physical art and social development. 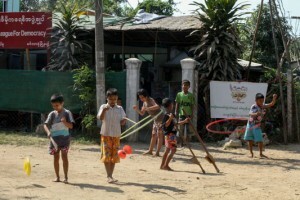 Social Circus is more than teaching circus skills. It is a tool for transformation, discipline, creativity and artistic expression. In its modern form, circus has gone beyond mere entertainment: play and circus arts are tools for teaching social skills, overcoming trauma and developing essential capacities and the ability to take responsibility. 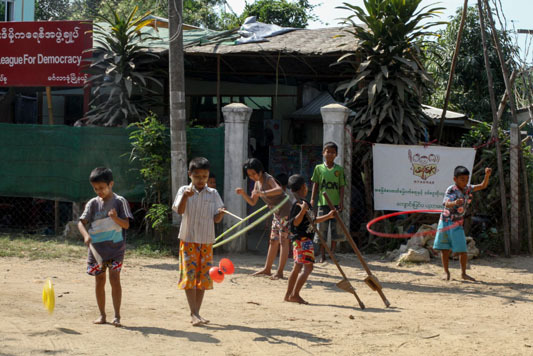 Social Circus shows the power of the arts as a tool for human development and social change. Social Circus nurtures a creative environment where young people can access quality arts training, learn how to share these skills in their own community, benefit from social support, develop their creativity and life-skills. Social Circus is accessible to all – participants don’t need to have literacy skills to take part and fully engage. It is free at the point of access. It works effectively with the poorest people but empowers them to engage, learn, play, laugh, join a group, share their skills and do things as a team across social boundaries. It feeds back positive energy into their community. 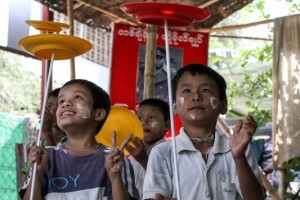 Boys practice spinning plates under the poster of father of the nation, Aung San.